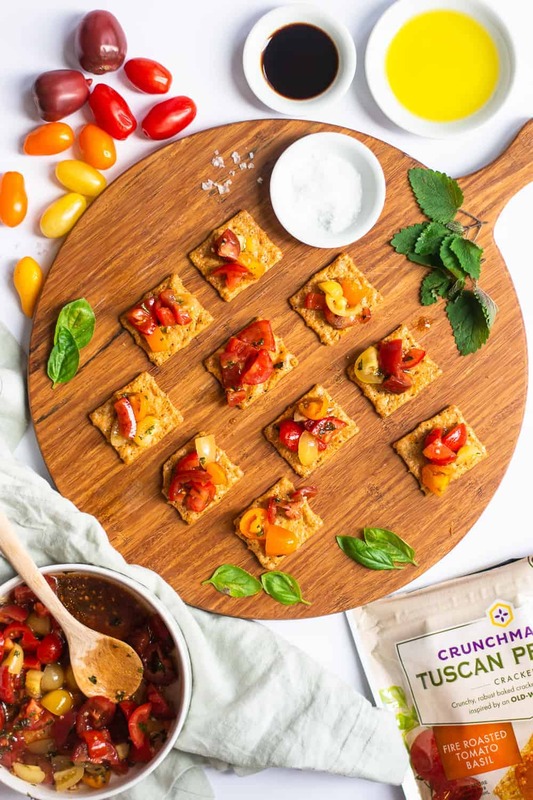 Get ready to eat some healthy and extra flavorful 5-minute vegan gluten free bruschetta without bread! Typically this is a dish made with crostini, which is toasted baguette cut into small slices. But since mama can’t have gluten, I figured out a different, better way to make traditional bruschetta with all the crunch and satisfaction. It’s the perfect way to celebrate Summer solstice! I know I will be snacking on this all summer long. 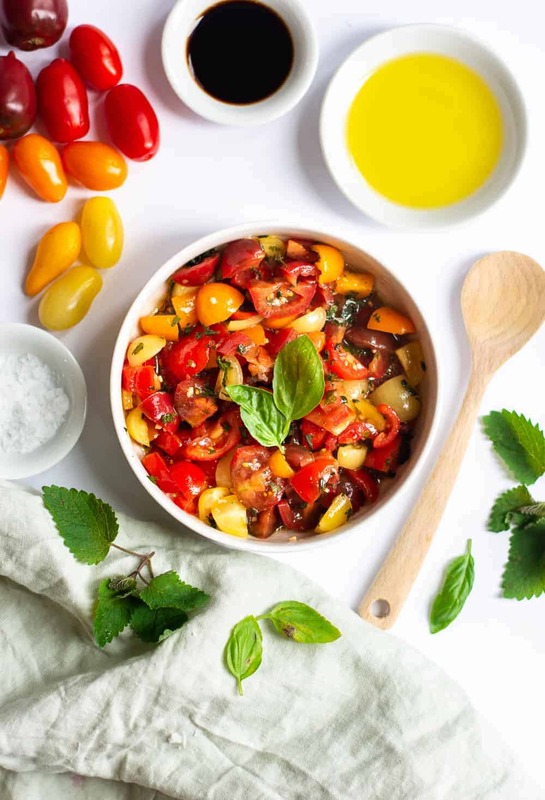 Mini heirloom tomatoes – these make this dish a beautiful appetizer if you need something colorful for your table. Olive oil – Who else here is an olive oil snob? The quality makes a difference! Invest in the good stuff, especially for bruschetta! Balsamic vinegar – I get the Kirkland balsamic vinegar at Costco and love their quality. Fresh basil – freshly picked basil from the garden is one of my favorite smells in the ENTIRE WORLD. It’s the key to making a dreamy, I’m-on-vacation-in-the-Italian-countryside bruschetta. 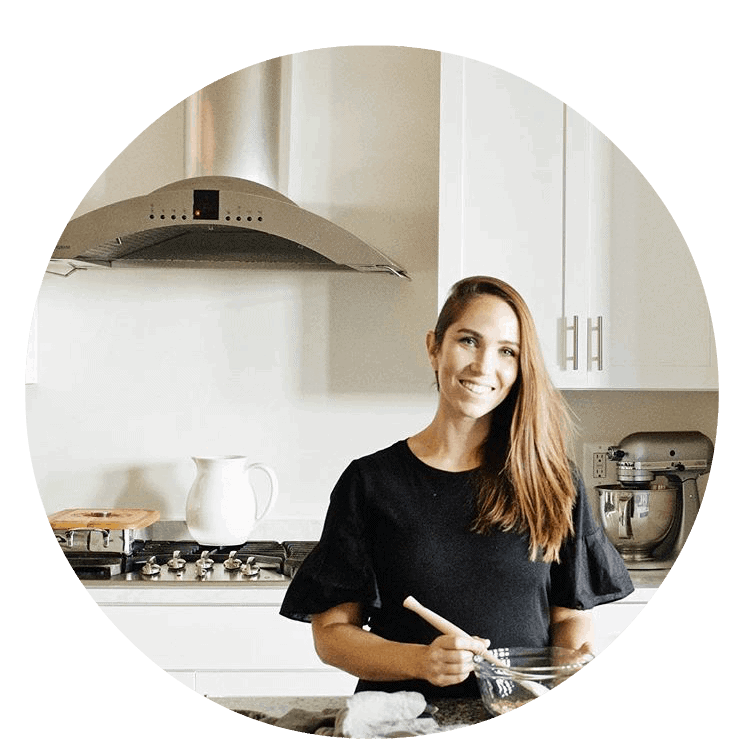 Sea salt flakes – You can totally use regular old table salt, BUT. Sea salt makes it even better tasting. Get the flakes! They melt quickly and have a fantastic flavor. Before I started cooking (read: when I was in my early 20’s), I had one knife only. It was a dull paring knife that I used to cut EVERYTHING. Including tomatoes. Have you ever tried cutting into a tomato with a dull knife? I might as well have used a side of the cardboard from my cereal box. What was left of my perfect tomato was a sad pile of juicy, red mush and seeds. I have since matured and broadened my kitchen accessories. 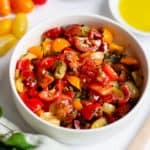 Puh-lease, for the love of good tomatoes and bruschetta, use a serrated tomato knife when you dice your tomatoes for this recipe! This one is good and only $7. You’re welcome. Ready to get your vegan gluten free bruschetta on? I thought so! You will love the fresh Mediterranean flavors of this bruschetta, and will probably be tempted to drink the remaining juice once it’s gone. 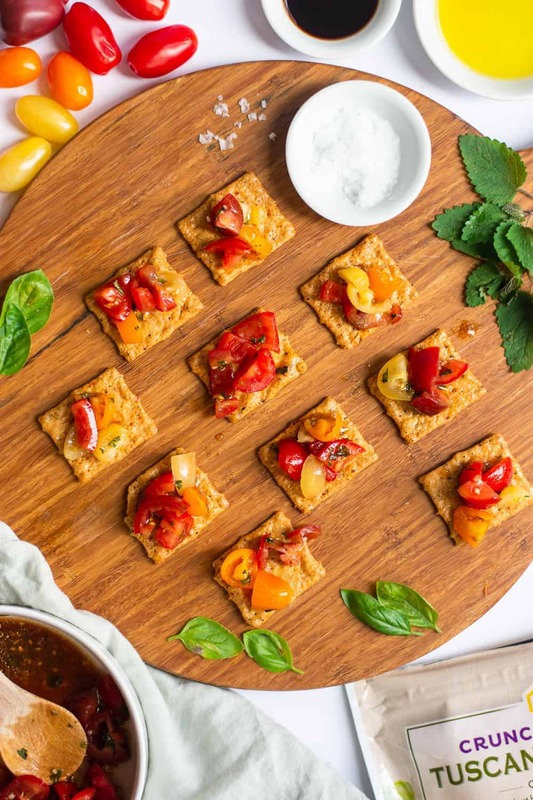 This recipe makes enough for 20 servings, so the perfect appetizer for yournsummer parties and meals! Grab the recipe below and enjoy! 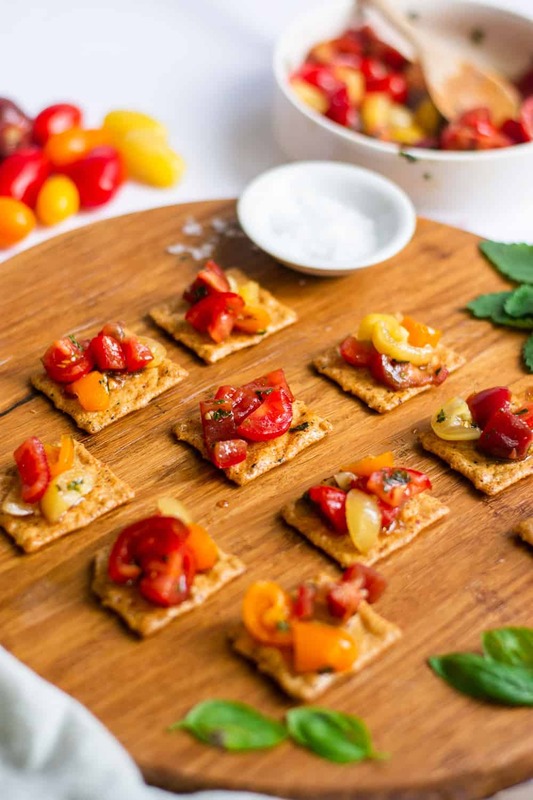 Make this 5-minute vegan gluten free bruschetta without bread for an easy and healthy appetizer. 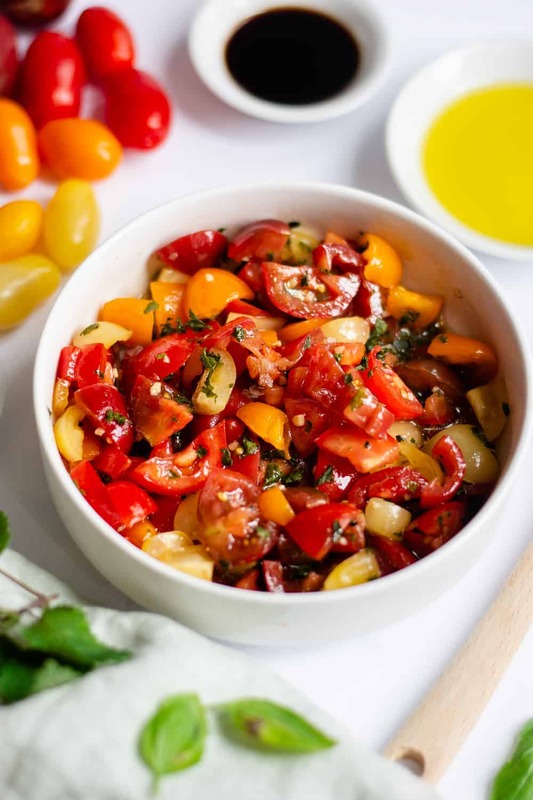 Cut tomatoes into small, diced chunks. Add to bowl. Mix in garlic, olive oil, vinegar, basil, and sea salt. Arrange crackers on a tray or serving dish. 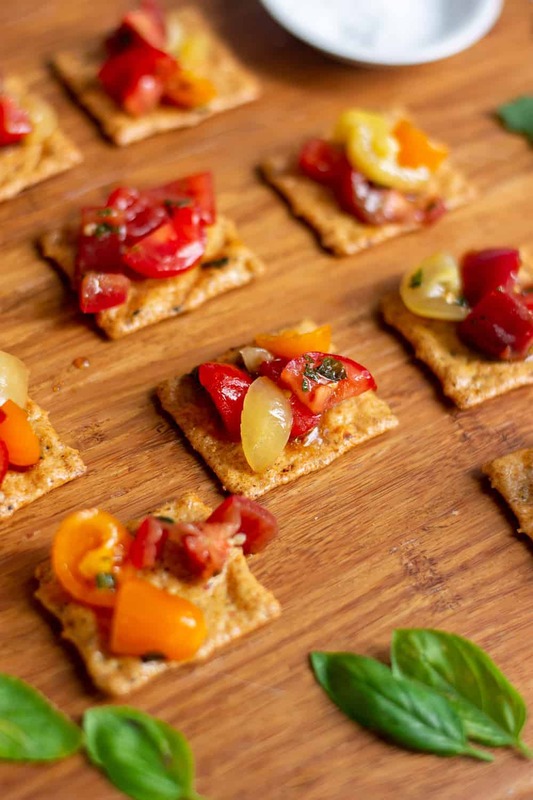 Top each cracker with a spoonful of bruschetta. Enjoy! Looking for other amazing appetizer ideas? Check out this goat cheese basil dip that is my top pinned recipe on Pinterest! 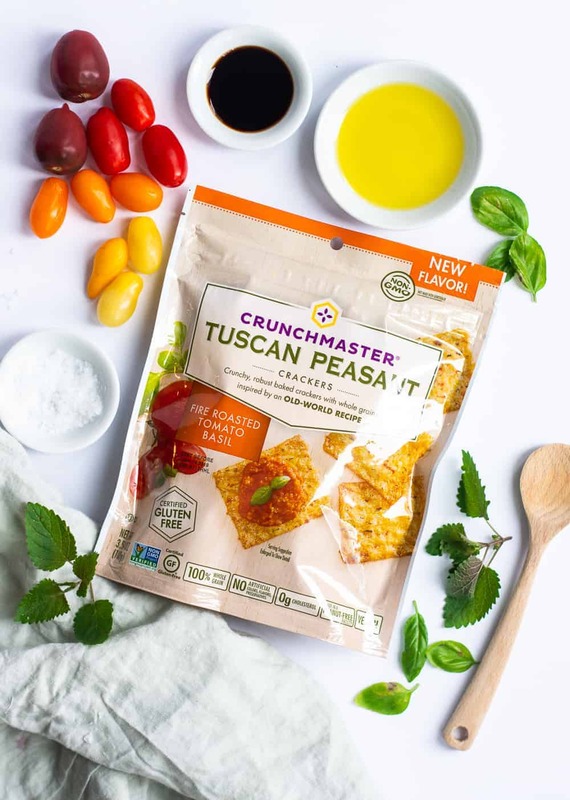 Sub in Crunchmaster crackers for the crostini for a gluten free version! This post is sponsored by Crunchmaster, a brand I love and recommend!